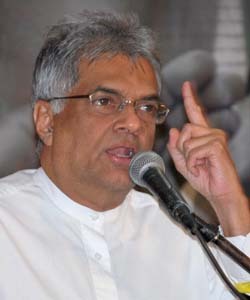 Several United Peoples Freedom Alliance (UPFA) parliamentarians have highly criticised the autocratic behaviour of Prime Minister Ranil Wickremesinghe in Parliament and Speaker Karu Jayasuriya’s biased actions. UPFA Gamini Lokuge speaking on the matter said that Wickremesinghe’s recent antics in Parliament was akin to “a bull in a China shop” expression. Lokuge cited the Premiers behaviour in a recent incident where he acted in an arbitrary manner while bypassing parliamentary ethics in announcing a decision to take up for debate several financial regulations on government spending, without prior notice to the “House”. Meanwhile UPFA MP Vasudeva Nanayakkara says that he is planning to lodge a complaint with the International Parliamentarians Association based in Geneva about Wickremesinghe un-parliamentary conduct. Nanayakkara says that the Premier is subjugating MP’s rights to express their views freely and also acting in a manner disregarding the reputation of parliamentarians. The UPFA MP is planning to attach video recordings with his complaint to the Geneva based IPA to prove his allegations. Meanwhile Dinesh Gunewardena, the leader of Mahajana Eksath Peramuna says Wickremesinghe is becoming a dictator in parliament. While expressing his disappointment over the actions of Speaker Karu Jayasuriya, Gunewardena says that the Jayasuriya has not taken any effective measures to stop Premier’s antics. Gunawardena says that the Speaker has so far failed to maintain discipline in the House and urges the Speaker to take immediate action to arrest the situation. « To Hang Or Not To Hang ?